◊ Many online marketers today use article spinners for their article marketing needs – a semi-automated process to rewrite one article into several articles that are uniquely viewed by search engines, therefore not being hit with duplicate content penalties. Article content spinner is the best choice for website owners that want to outshine their competitors with a multitude of published works on the Web providing backlinks, targeted traffic, and credibility. 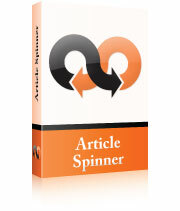 ◊ You can benefit from our Article Spinner immediately, with its quick and easy-to-use system. The application allows you to rewrite a large number of articles by replacing words in the original article with synonyms from a large synonyms database. Imagine having access to this rewriting software that uses over 500,000 words in English, German, Spanish, French, Dutch, Portuguese and Romanian. Content rewriting has never been easy because of the manual time commitment, but now it can be realized through a few simple clicks. Additionally, Article Spinner allows random paragraphs to be added, which will definitely contribute to producing unique, high quality articles. ◊ Article Spinner produces top notch content. Unlike the majority of related content spinning and rewriting software that produce low quality content with poor flow, our Article Spinner offers the benefit of blending harmoniously from one sentence to another and one paragraph to another in the final product. The result? High quality, readable and naturally-flowing content for your visitors. ◊ Article Spinner is fast-operating. You can spin any PLR article (or other article that you own rights to) with just few clicks! It takes only a few seconds for our content spinner to rewrite any article and turn it into a 100% unique piece of content. You can use the unique, quality content to achieve high rankings in search engines and draw countless visitors. Instead of hiring a team of expensive writers that will produce hundreds of original articles in a couple of months or more, you can use our content spinner too produce the same amount of original, high quality articles in just A FEW MINUTES! Watch a complete article spinning demo ! * Article Spinner is recommended to be used with PLR article (or other article that you own rights to). Article Spinner owners can't be held responsible for any damage if the software is used to rewrite copyright-protected content. We only advocate its use for PLR articles or the content you own. The price does not include VAT. The license is valid 2 years after purchase date and subject to terms and conditions.